Below is my recipe for a nice tasty nutritional spice cake that is made with some surprising ingredients. In addition, because the original recipe has a long history, which probably predates the depression era, read my "Baker's Note" as well. Preheat oven to 350°F. spray a 9" round cake pan, or 9" x 2" with cooking spray. Line pan with a parchment circle and spray again. Cream butter and sugar in large bowl. Add egg and mix well. Combine baking soda with undiluted soup in can. Let foam for 1 minute. Pour soup mixture into butter/sugar/egg and blend well. Mixture will look slightly curdled. This is normal. In a small bowl combine flour, hazelnut meal, baking powder and spices. Whisk well and add to tomato soup mixture. Beat together for 1 minute on medium speed. Pour into prepared pan and bake for 30-35 minutes. Top each serving with cool whip or ready whip ice as desired. 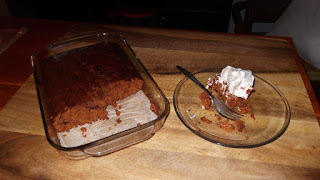 This recipe is a variation on a Great Depression Era tomato soup cake. I learned about it from several YouTube videos and websites. However, after reviewing some of the ingredients in those recipes, I decided to tweak a favorable recipe that called for fewer ingredients. The most noticeable changes were that I halved the recommended spices as I generally use wholesale spices, which to me are stronger than what is sold in local stores. In addition, because I like hazelnuts, I decreased the flour to 1 1/4 cup, and replaced it with a fourth of a cup of hazelnut meal. This made the batter thicker than it needed to be so I added some fruit juice. I recommend either Sunny D Original or 100% orange juice. As for the title of this recipe, it is my personal choice because I used Saigon cinnamon, which is bolder than regular cinnamon, and I like the sound of it. The trick about many recipes is that it is fun making them your own. So feel free to add your own tweaks to suit your taste.